Cashintransit: Jesus To Appear In Court? Jesus To Appear In Court? day. 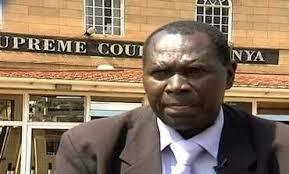 'Kenya Lawyer Sues Isreal for killing Jesus'. Isn't this interesting? claims the killing was 'unlawful'. Indidis, who has taken his case the ICJ in The Hague, is also suing Tiberius, the emperor of Rome in 42 BCE, “Pontius Pilate, a selection of Jewish elders, King Herod, the Republic of Italy, and the State of Israel,” according to the Post. Indidis is using the Bible as his primary piece of evidence against Israel. Indidis was quoted as saying by the Kenyan Citizen News. should still be held responsible', Indidis, who reportedly is a former spokesman of the Kenyan Judiciary, insists that he has a 'duty to uphold the dignity of Jesus'. judicial misconduct, abuse of office bias and prejudice". trial and that his resulting punishment was unfairly carried out. “I am suing as a friend [of Jesus],” he was quoted as saying. consider this case', according to the Post.